When it comes to choosing the right bridesmaid dress, it may seem like a daunting task, especially if your bridal party consists of many. We say that it doesn’t have to be complicated! In an attempt to help make the process a little easier to tackle, Blue Linden has compiled a concise list of tips and suggestions for choosing the right bridesmaid dress for each of your lovely ladies. Pull from your wedding style and your personal aesthetic for bridesmaid dress ideas. You can also ask your bridal party (to some extent) for their opinions, but don’t let their voices drown out your own. Use pinterest, wedding-forward websites, and magazines for all kinds of suggestions that may not have occured to you. Then take all of that and create mood boards to strike a personal connection with all of your ideas! Speaking of personal aesthetic, consider your own gown for inspiration in choosing the right bridesmaid dress. Pick a singular point (or an overall theme) from your own wedding dress to influence the route you go for the bridesmaid dress. It’s safe to assume that most people know the cost of a bridesmaid dress falls to the person who’ll be wearing it, but a gentle reminder is probably a safe bet. Knowing that, choosing the right bridesmaid dress means choosing the right price. Be considerate of your bridal party’s wallet, possibly asking each lady’s max price-point (privately, of course) to give yourself a mental cap to bear in mind. You could look into bridesmaid dress rentals! If you’re willing to relinquish a little control in choosing the right bridesmaid dress, give your ladies a set of limitations and then let them have free reign. Show them a few pictures, tell them their set color (or hues), and a desired length, and see what they come up with (running it by you for a final confirmation). Nothing is worse than looking back at pictures from your summer wedding and seeing smeared makeup and sweat dripping from bridesmaids decked out in dresses meant for the dead of winter. What we’re saying here is, be conscious of the climate. It’s not that you can’t put your ladies in a knee-length, strapless bridesmaid dress in the middle of December, but make sure to budget-in cover-ups (and possibly some giant heaters). What color do you want to feature: completely solid or a pattern, all bridesmaids in the same color or multiple hues? What about the cut - sweetheart, straps, or halter neckline, sleeveless or a capelet, above-the-knee, tea-length or floor hemlines? And the fabric itself - starchy and shiny or soft and flowy? There are endless combinations of styles and specifics when it comes to choosing the right bridesmaid dress, and there’s really no easy way to make these decisions. But refer back to the ‘Get Inspired’ section above for ways to help you come to these conclusions, and if needed, rely on the opinions of your hired professionals for what they may know have worked in the past! Make sure to take into account the sizes of all your bridesmaids. While the average bridesmaid dress is created with your stereotypical skinny/tall model type in mind, it’s likely you’ll have ladies of all shapes and styles (and perhaps even one that’s expecting!) in tow. Is the bridesmaid dress you’re considering offered in every size you’ll need or can it easily be altered? Don’t forget about COMFORT! When you’re choosing the right bridesmaid dress, either you (or your ladies in tow) try it on and MOVE around in it. It’d be a miserable time over the course of the night if the chosen dress is stiff and restrictive, especially if you’re planning a shimmy-shaking, boogy-good time. If you’re choosing to mix it up, with each lady wearing a different dress, make sure you have at least one unifying element amongst the bridal party. On average, it can take about 3 months for an order to arrive and about 6 weeks for alterations, so keep that in mind when you’re constructing your wedding timeline. Don’t go shopping until you and/or your bridesmaids are prepared! Do research, send links, have group chats about expectations, and go in with a solid idea of what you want in mind. If all bridesmaids aren’t in attendance at the point of ordering, come prepared with all missing ladies’ measurements! It’s important to order all bridesmaid dresses at the same time so they’re made from the same dye lot. Make sure that all payment decisions are made in advance to save time and misunderstandings at the point of purchase. To sum this all up, any decision made should ultimately be that of the bride, and one that won’t give any regret when looking back on the captured memories. 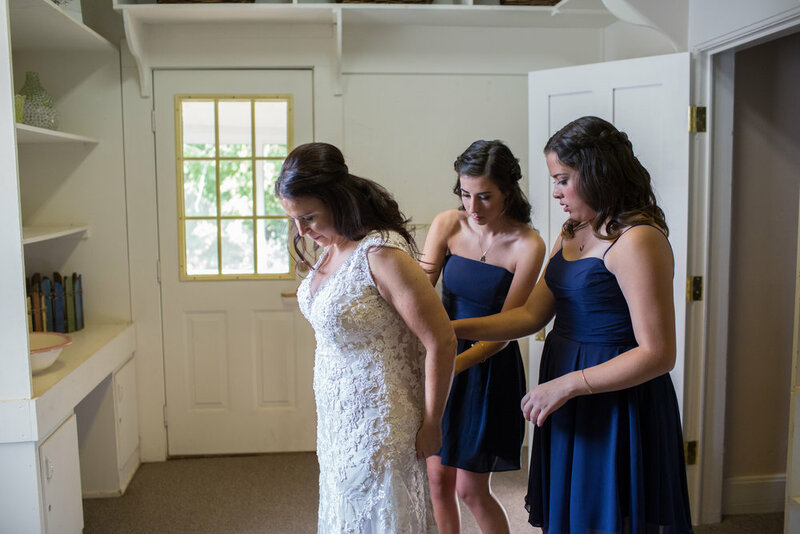 Choosing the right bridesmaid dress may prove a difficult task, but if you lean on the people around you, keep these tips in mind, and follow your heart, we have faith that you can easily come to a decision while saving the feelings of all involved. And if you need a “referee” in the decision-making process, don’t hesitate to consider a wedding coordinator, like Blue Linden, to step in and help out! Feel free to reach out to us using the social media buttons below for even more advice on this decision-making process and many others revolving around your big day!